Trinley Paljor Rinpoche is a retreat master and one of the chief lineage holders of the Karma Kamtsang (Karma Kagyu) lineage. Originally from Nangchen, Eastern Tibet, Khenchen Trinley Paljor Rinpoche entered the Bakyod Samdrup Choling monastery at age 5. At age 19, Rinpoche took the gelong or full monk’s vows from the 11th Situpa, Pedma Wangchok Gyalpo and entered his first of three 3-year retreats. During Rinpoche’s first two 3-year retreats he received the complete empowerments, reading transmissions and practice instructions of the Karma Kamtsang lineage. These retreats were conducted according to the tradition of Tsurphu monastery, the historical seat of the Karmapas. Also during this time Rinpoche made a pilgrimage to the holy places of Central Tibet and met the 16th Gyalwa Karmapa, Rangjung Rigpe Dorje for the first time. During Rinpoche’s third 3-year retreat he guided the retreatants in the capacity of Drubpon or retreat master. In those years spent practicing in the retreat center, Trinley Paljor Rinpoche relied upon three retreat masters: Saljey Rinpoche and Tenpa’i Nyima Rinpoche, both incarnate lamas of the monastery, and Beru Karma Konchok, who, having spent twelve years in sealed retreat, taught the retreatants through the small window of his room. In this way, Khenchen Rinpoche received detailed guidance through personal experience in the practice of Mahamudra and the Six Yogas of Naropa. In 1959, due to the communist invasion, Khenchen Rinpoche fled his native Tibet for India, where he was to take part in the activities of the 16th Gyalwa Karmapa’s new monastic seat in exile, Rumtek Monastery. While at Rumtek Monastery, as well as in Bhutan and elsewhere, Rinpoche received a wealth of empowerments, reading transmissions, practice instructions and pith advice from numerous accomplished masters headed by the 16th Gyalwa Karmapa and Dilgo Khyentse Rinpoche. From the 16th Karmapa, Khenchen Rinpoche received the Treasury of Kagyu Tantras (Kagyu Ngagdzo), the Guru Sadhanas of Marpa, Mila and Karma Pakshi, Long Life empowerments, as well as personal guidance. From Dilgo Khyentse Rinpoche, Khenchen Rinpoche received a vast amount of Dharma teachings, guidance through personal experience and transmissions primarily of the Nyingmapa tradition as well as from the Kagyupa and Sakyapa schools, such as the New Treasures of Terchen Chokgyur Lingpa(Chokling Tersar), the Treasury of Precious Termas(Rinchen Terdzo), The Hundred Thousand Tantras of the Old School(Nyingma Gyubum) the Four-Part Heart Essence(Nyingtik Yabzhi), the 7 Treasuries of Longchenpa(Dzo Dun), the Hearing Lineage of Rechungpa(Rechung Nyengyu) , the Treasury of Pith Instructions( Dam Ngag Dzo), the Compendium of Sadhanas (Drupthap Kundu), the Collected works of the 15th Karmapa (Kakhyab Dorje Sungbum), and the Prajnaparamita and the Root Verses of the Middle Way. From Tulku Urgyen Rinpoche, he received the Hundred Empowerments of Chod (Chowang Gyatsa). From Dudjom Rinpoche Jikdrel Yeshe Dorje, Rinpoche received the mind treasures (gong ter) of Jamgon Kongtrul Lodro Thaye and the Prayer to Guru Rinpoche in seven Chapters (Lu‘e Dunma). From the 8th Khamtrul Rinpoche Dongyu Nyima, Khenchen Rinpoche received Gampopa’s Ornament of Precious Liberation and other transmissions. While in Bhutan and with the intention of continuing his practice in life-long retreat, Trinley Paljor Rinpoche received a letter from the 16th Karmapa, asking Rinpoche to return to Rumtek to take up the position of personal tutor to the 4th Trungram Gyaltrul Rinpoche.Though Khenchen Rinpoche had wished to spend the rest of his life practicing meditation in retreat, he followed the request of the 16th Karmapa and Dilgo Khyentse Rinpoche and has worked closely with Trungram Gyaltrul Rinpoche to this day. Khenchen Rinpoche has since the early 1990’s taught the Dharma, bestowed tantric empowerments and conducted vajrayana rituals while residing at the U.T.B.F. 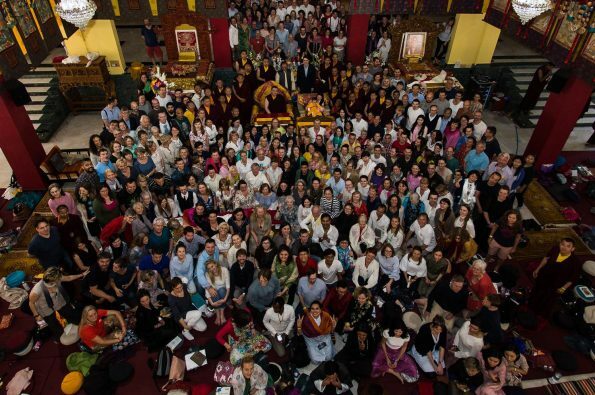 dharma centers in Taiwan, Hong Kong, Singapore, Malaysia and Indonesia. As well as in more recent years the U.S.A. and other countries. In 2002, at the directive of Kunzig Shamar Rinpoche, Trinley Paljor Rinpoche guided the 17th Gyalwa Karmapa, Trinley Thaye Dorje, in a three month retreat. Thus transmitting the Karma Kamtsang tradition’s Six Yogas of Naropa to the Karmapa and other incarnate masters, such as Trungram Gyaltrul, Nendo Tenam and Dupsing Rinpoches. Now in his early 80s, Khenchen Trinley Paljor Rinpoche lives primarily in rural New York. There he gives Dharma teachings, empowerments and with great kindness guides those interested in the authentic Buddhadharma. Together with Trungram Gyaltrul Rinpoche, Trinley Paljor Rinpoche is a main teacher of the Dharmakaya organization in the United States.